Kaduna (Nigeria) – Determined to ensure that every nook and cranny in Kaduna State and beyond get to understand and appreciate child spacing as the best option for reduction in maternal death, a 25 man media committee was inaugurated by Development Communications Network (DevComs), in partnership with Nigerian Urban Reproductive Health Initiative (NURHI). In Kaduna State, it is estimated that 1 in every 13 pregnant women dies in the process of adding a new life to mankind. The Child Spacing Media Forum is meant to advocate for improved child spacing funding and utilisation of approved funds by government, as well as sensitise and educate the citizens on the need to embrace child spacing as the best option for a healthy society. Aside Kaduna State, the Media Forum will be replicated in Lagos and Oyo States, where NURHI is currently implementing projects aimed at making child spacing a norm. The Kaduna Forum is headed by Jacquelyn Adebija of Invicta FM, Kaduna, as Chairperson, with Mohammed Ibrahim and Sola Ojo as Vice Chair and Secretary respectively. Sekyen Dadik, Coordinator of Africa Media Development Foundation (AMDF), who spoke on behalf of Devcoms and NURHI, charged members of the forum to work in new ways that would bring the message of child spacing and what the society stands to achieve to the doorstep of every household in Kaduna and beyond. 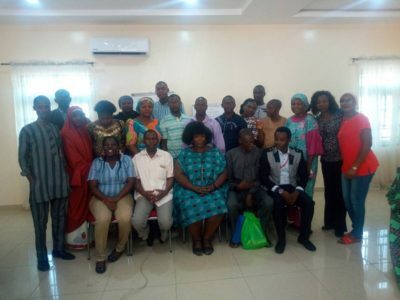 Most members of the Media Forum expressed willingness to ensure the realisation of set objectives, to create a sustainable child spacing advocacy effort after NURHI’s project ends in 2020. Israel Bulus, a member, noted that “it is an honour to be part of any project that is meant to salvage the wellbeing of women and children,” who he said, have always been at the receiving end. Mohammed Ibrahim, the vice chairperson of the forum explained that his presence would spur him “into action” towards contributing his “quota towards a better society in the future”. Shindong Bala also observed that the inauguration of the media forum meant to preach the importance of child spacing in the country believed that “it would have a positive impact in the lives of many homes towards embracing the message and practice of child spacing”.